Unity Noobs: Roll a Cube. 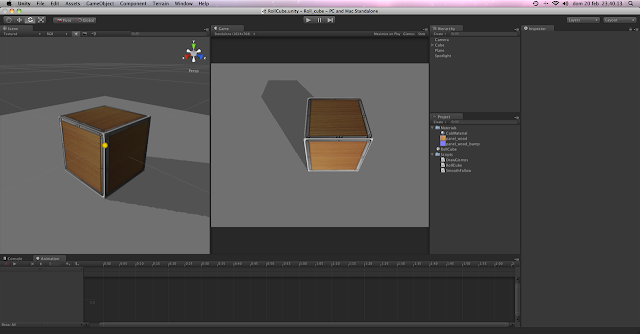 I'm working in a game type which the main scope is to roll a cube, i was searching methods to do this, and the best way which i could found is the method described by HiggyB in unity answers forum ( http://forum.unity3d.com/threads/16190-How-to-move-camera-automatically/page2). So let's Work! // Make sure the angles are snaping to 90 degrees. Dont forget to give values to the variables in the editor. In the next post I intend to show how to load parameters from a xml file. I hope you enjoy it, give your comments! Hello, do you know if I can reuse this code but using forces instead of translations to move my cube and having axis constraints to stabilize the movement? Assets/Scripts/RollCube.js(37,35): BCE0051: Operator '*' cannot be used with a left hand side of type 'Object' and a right hand side of type 'float'. Attach Rigidbody to take care of collision. Hello, Creating a bool variable called automatic = true; for example. Thank you very much for yout help it works now. I had actually made a Coroutine out of the function at first. But there is a point that I don’t understand. I removed the if statement to enable the Start of the couritine in the update function and this made the cube spinn completely wrong. Why does it work now, by putting an if statement which tells exactly the same thing (bool variable is always true)? by starting the coroutine in the update function, you are calling the coroutine many times before this is complete finished. if you restart the coroutine at the end, you will execute once at time. Can somebody please convert this script to c# ? I need in a C#. Please help me!